One of our Grade 8 students participated in the Tokyo Spelling Bee contest. He went further than any other TIS student had in the past, making it to round 7. Thirty-five contestants participated in the Tokyo round. The winner moved on to the global round in the United States. 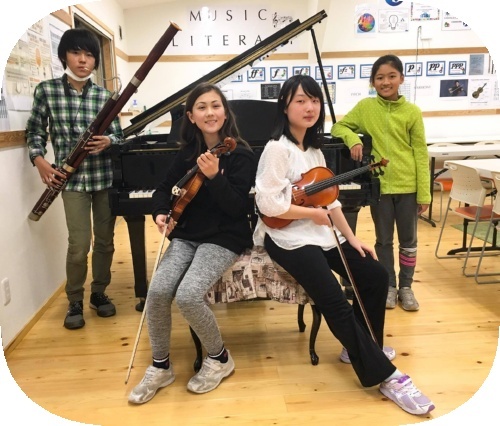 Four of our students passed the audition for the Tsukuba Junior Orchestra. Grade 9 students worked with Grade 5 students to develop their understanding of pi (3.14159). The Grade 3 class presented their research on energy and renewable energy sources. 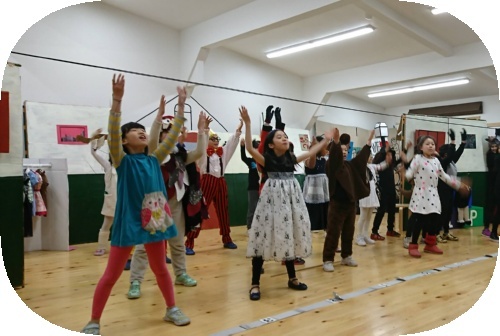 The Grade 4 students worked together with Miho Umehara and Junji Ohtaki from Kurie Drama Club to put on a performance of Toys in Pieces. The Grade 4 parents contributed hours and hours of their own time to design the impressive sets and props. As happens every year, things start to take shape more and more as the day of the performance gets closer. After the finale, the students gave a finale rendition of “Home” to rousing applause. The PYP students met with their parents and teachers to discuss their progress during after school meetings from March 27 to April 7. This is a very valuable time for the three people who are most involved in the students’ learning to come together to discuss successes, areas for improvement, and plans for the future. We held our Open School Day and Parent Circle (for parents of current TIS students) on Tuesday, March 14 in the afternoon. We welcomed Mr. Iwata, our new groundskeeper, to our team on March 13. 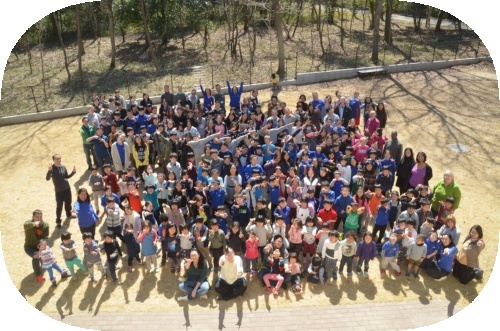 Mr. Woollard attended a JCIS workshop about Child Protection at Nagoya International School on March 11 and 12. Mr. Woollard attended a CIS workshop on Child Protection in Singapore on March 24 and 26. Mrs. Handa attended the COBIS conference on March 27 and 28. Mrs. Suzuki, Mr. Africa, Mr. Congreve, Mr. Coleman, and Ms. Crawford attended the IB Global Conference in Yokohama from March 29 to 31. We held our second professional development day on March 31. Six teachers are participating in a course that helps all teachers become good language teachers, regardless of the grade or subject that they teach. The fundamental concept of this course revolves around identifying the genres of language that are important for a particular lesson or unit and developing ways for teachers to scaffold the students’ learning so that they can master that genre. 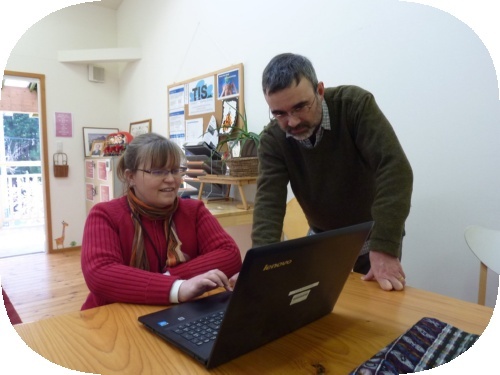 The course runs for eight sessions in total and it met once (March 13) this month. It is being led by Ms. Suzuki. Our school counsellors held counselling sessions on March 21 and 24. A small committee of board members (called the “Working Group”) met on March 9 to discuss our thoughts about purchasing land. We are currently renting the land that our PYP and MYP fields are on, and we would like to eventually own that land. The Working Group decided to renew our leases on these plots of land for another year in order to give us more time to discuss this issue. On March 17, we took a day out of our schedule to stop and think about the things that make us happy. We spent time with the people in our school community and celebrated our friendships with each other. This was done in memory of the people who lost their lives in the March 11, 2011 disasters, and to remember Mr. Kano, our former principal, who passed away one week after the earthquake (March 18, 2011). The spirit of the day was “relaxed fun” for all members of the school community. We held our monthly School Information Session (for prospective parents) on March 22 from 10:15 am. Eight families were in attendance. We interviewed seven potential new families this month. 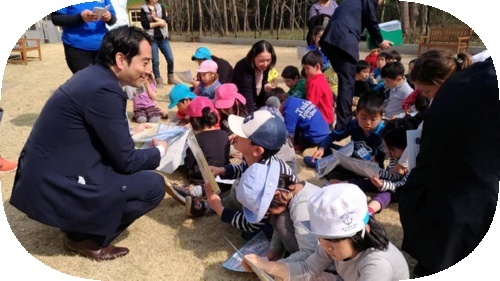 The mayor of our city, Mr. Tatsuo Igarashi, visited our school on March 30 to distribute special English versions of manhole cover cards that were produced for our city. The PYP students were the lucky recipients of the first sets of English cards. 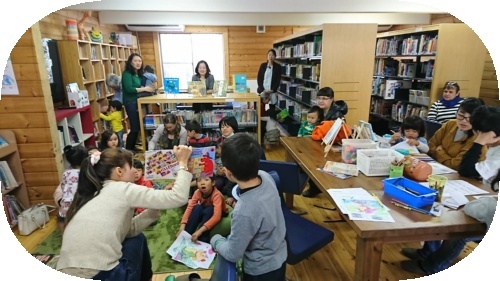 We held our first ever “TIS Reading Club” event for international families in the Tsukuba area on March 18. 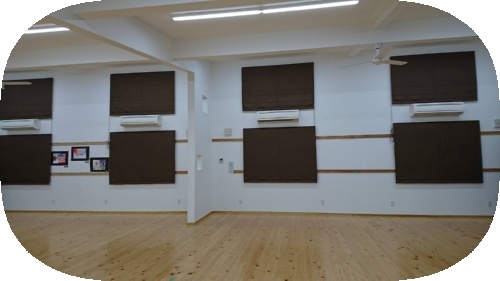 (Many people in Tsukuba crave English books, both for themselves and their children, and our library has lots of them!) We welcomed around 20 families to the school. Parents were able to chat, catch up with friends, and read, while the children read books, drew pictures, and coloured. One of the moms even agreed to read out a couple of stories to the children! Afterwards, we moved out to the primary field to play in the lovely sunny weather, and some families even stayed afterwards for a picnic. It was a wonderful way to spend a Saturday morning with friends in Tsukuba! Ms. Crawford attended the graduation ceremony at Katsuragi Elementary School on March 23 where two TIS students received their certificates. Forty-two Grade 4 students from Lilyvale Primary School (Mito) came to watch the final dress rehearsal of our Grade 4 play on March 15. 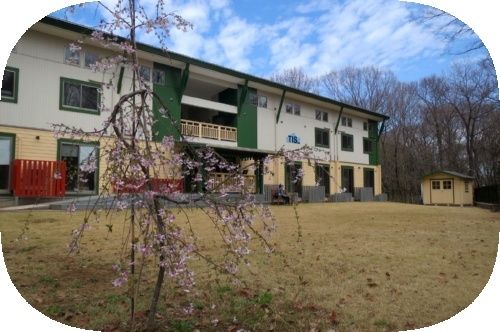 We have a special relationship with Lilyvale because of their focus on theatre arts. Every year for the past three years, our grade 4 students have visited Lilyvale in December to watch their rehearsal, and Lilyvale students have then come to watch our rehearsal in March. 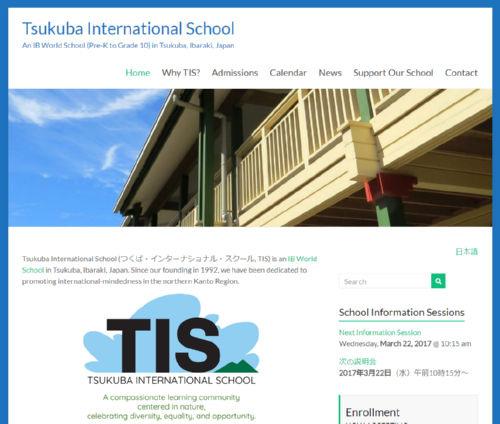 You can read about the day (in Japanese) on the Lilyvale website. Ms. Crawford attended a meeting about the International Baccalaureate at the Ministry of Education, Culture, Sports, Science and Technology (MEXT) on March 9.